Our family is having a cord cutting summer. Our youngest child leaves for college in August and as people continue to remind me, we are going to be “empty nesters”. Cutting that cord will be one of the most difficult things I have had to do. However, we recently did some other cord cutting around our place that was much easier than I thought it would be. 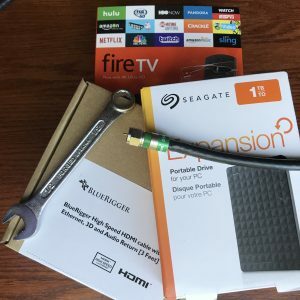 Audio/Visual equipment is not my thing so I will not be expanding the list of Computer Monkey services to include Cord Cutting assistance, but I’m happy to share what worked for us. We had a bundled plan with our local cable company that included telephone, internet and TV. Our monthly bill had passed the $250 mark and was going to go up significantly when it became necessary to pay a monthly fee for a digital converter box for each of our televisions. Some of which were rarely used, but were in certain rooms for convenience. Hence, we started looking into cutting the cord. To replace cable service we had to think about how to get the channels that we wouldn’t want to be without and how to replace them. In order to do that, we would need to get the local channels broadcast over the air coupled with a streaming service of some kind. The streaming service requires a device for delivery. Some smart TV’s have that built in. The TV itself is the device in that case. To get the over the air channels you need an antenna. We opted for a whole home antenna rather than putting one on each TV. We have a large home and a significant number of TV’s so we opted for the Marathon HDTV Amplified Long Distance Antenna from freesignal.tv. Our house had been wired with coaxial cable throughout, so we were able to replace the cable company line with the coaxial cable from the antenna and the antenna signal was fed to all of our TV’s. We then had to figure out which line was delivering the cable company signal to the modem for internet so we could keep that connection in place. We had a little trouble getting all the channels to come in clearly and had to contact Marathon support, their support was busy and probably took longer than usual but they did return our calls and respond to our emails. I will say that the resolution was actually easier than what they were suggesting. All we had to do, as it turned out, was move the location and direction of the antenna. They thought maybe the amplifiers that were in our original cabling scheme were causing interference, which was certainly reasonable concern. Now we had broadcast channels. But, in order to get the cable channels we wanted we opted to go with Playstation Vue streaming service. (Others include: Sling TV, DirecTV Now, YouTube TV, and Hulu with Live TV ). The folks at KillTheCableBill.com have an Online TV Channel Matrix (click on image to zoom) to see what services offer the channels that are of interest to you. With each service there are typically varying packages with varied price points — more channels, more money. Our chosen streaming devices are Amazon Fire TV and Amazon Fire Stick. We have Amazon Prime and we tried them out and they worked well. I had tried a Roku already and wasn’t wild about the interface/remote, but they get excellent reviews and a lot of people really like them. Here is a recent article about the various streaming devices to help you decide what’s best for you. So we had all of the channels we wanted, but had lost some of the viewing convenience we had with having a DVR from the cable company. Even with a streaming service, network television shows are considered “on demand” which doesn’t give you live access to network television shows and doesn’t allow fast forwarding when you watch them. Also, we would not have been able to record locally broadcast channels. In order to mirror the functionality that we had with cable, we got a DVR that would allow us to record locally broadcast. We chose the Channel Master DVR +16GB. We opted for this less expensive ($249) model where you connect your own external hard drive rather than the other model ($399) that has a 1 TB drive inside because I can purchase my own external hard drive for $54. As I always tell people when I urge them to back up their data, a hard drive crash can happen at any time. If ours crashes, I’m only out $54 if it is out of warranty. I would rather do that than pay another $399 for the complete unit. The Channel Master is great when coupled with a better quality remote. We had a logitech harmony remote that it works beautifully with, but like many manufacturer remotes, the one that came with the Channel Master DVR wasn’t very good. Have you “cut the cord”? Please comment below about the products/services you use it may help someone with their decision making process. The dvr is a Tablo system. It connects to the splitter itself. Then you download the Tablo app to the Amazon Firestick/TV and set up recordings. You can watch your shows on any Firesticks/TVs you have after the app has been downloaded to them. I am pretty sure I saw the Tablo app available for roku when I was helping my dad with some stuff. Not sure about any other streaming devices. We went with PlayStation Vue as our streaming service. We have been happy with it. We have also heard good things about YouTube Tv. We have had a very good experience with this whole thing. Our antenna worked perfectly and I love the flexibility of the Tablo. You will see it is more expensive up front. You can also purchase an external hard drive for it to store more, but we haven’t needed it. My parents have also cut the cord. My dad was not happy with the first antenna he chose but then he bought another one that he likes. The brand is Pingbingding (not kidding) from Amazon. It has to pick up signals about 80 miles away and there are some mountains in between. It seems to work well. We have also heard that there can be issues with antennas if you are too close to the broadcast signal antenna. He told me a lot about what he was learned through this process. I will give you that info as well. 1. If you have signals coming from different directions, TV Fool http://www.tvfool.com/ recommends getting two single direction antennas, mounting them 6 feet apart, and use a 2 way splitter backwards to combine the signals together to feed to your TVs. 2. The $8 rabbit ears from Walmart that you can attach to each TV work great. He tried this first on a TV to see what channels he could actually get.